The official page says that Just My Imagination will be released on (or about) Sepetember 30th. However, a few online music shops have listed Just My Imagination for an October release. So has it been pushed back? I’ll keep you posted. I don’t know where the tracks were recorded or if the price of the book rose because of the CD. Thanks to Brian Woodruff (bbam@infinet.com) for the info! “Hi , it’s me again. We are in Minneapolis, and badly hung over I’m afraid!! We played in Chicago last night and it was a great gig so everyone was in flying form. As today is Dolores’ birthday we threw a surprise party after the show which continued onto the bus. We have about twenty or so people working with us on the tour and they are all really nice so it’s always good to have a night like that to help everyone relax after working so hard for the past few weeks. I’m afraid I have to go back to bed now for a snooze so I’ll talk to you again in a few days. Dolores turns 28 today.. Happy B-Day Dolly! Appearently, there is a new edition of the Loud and Clear Tour Book. It comes with a limited edition CD, but what it is, I’m not sure. If I had to guess, I would assume it’s the 4-track live CD that came with some limited editions of BTH, but I don’t know for sure. When I get more info., it’ll be up here! 16th Sept: Band will be making an in-station visit to KYSR/Star Lounge. (3 acoustic tracks). Sorry for the delay in updates.. Tripod has been screwy. Aaanyway.. I couldn’t fit the litho into my scanner, but you probably know what the top looks like 🙂 The auto is lighly in pencil, but you should be able to see it. It’s getting late, so I’ll have nuz up for ya tomorrow. “i dont know how many in this group actually watch the show, so ill explain it well. Thanks to Delilah165 (delilah165@aol.com) for the info! I’ll have some more stuff up for you later. It’s about time! A new commercial bootleg has arisen from the first leg of the Loud and Clear tour. The CD’s title is “One’s Better Self”.. check out the coverart.. The show was recorded in Hamburg, Germany, April 16th, 1999. Sorry about the image tag, but I’m getting a guy taking whatever he pleases off my page, so all images from here on out will be tagged. Again, sorry.. I will discontinue the tags if the person stops his plagiarism. For those that attended the Homdel, NJ show on August 13th, get out your wallets! The show was recorded (probably by an ameteur) and is now available on a 2-CD set. The set is now up for auction at eBay, so if you’re interested, you’d better bid fast! The show rocked, but viewers also got a little bonus. During a commercial for Bury The Hatchet, a clip of the upcoming video for “Just My Imagination” was aired. The video is taped in black and white. Dolores has the short hair look with lots of highlighted freckles on her face. The band sits with their instruments and play on a blank white set while Dolores sings into an exacto blade-shaped microphone. If you missed the show and would like a copy of it on video, drop me an email at ! I am a man of my word.. so on with the new stuf!! Listed below are pics and prices, along with descriptions of the new merchandise sold at the current Loud and Clear Tour. Description: Navy blue T-shirt with the Animal Instinct cover on the front. On the back, it has a small logo near the top, “Mustang’s Rhythm On the Road Tour” in pink. Description: It’s a poster.. pictures speak louder than words. Description: Looks like they had some of these left over.. they can be ordered from cranberriesstore.com. Description: A forest green shirt. On the front is a circular picture of the band with “Animal Instinct” written beneath. Description: A shirt for the ladies. It’s white with a small pic of the Promises bear burning on the front. Description: An olive green golf shirt. On the front near the pocket area is the eye sewn in with “The Cranberries” and “Loud and Clear Tour” stitched above and below respectively. Description: I shoulda got this! Its a moving mouspad (like those Baseball cards from the 80’s). The eyeball bobs up and down while the man stares at it when you look at it from different directions. Description: Smoking bear on the back.. non-smoking bear on the front. Navy T-Shirt. Now why do I think this, you ask? As you can probably see, this is a pic from the postcards included with the program. NOW, each one of those postcards has coverart on them. On the back of each postcard, it says what the name of the CD it is that that art if from (Ex: Postcard with burning bear says “The Cranberries : Promises” on the back). 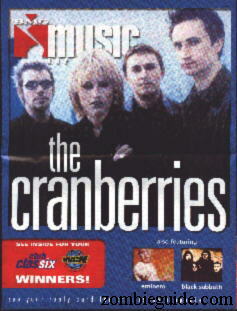 On the last postcard with this image, it says “The Cranberries : Just My Imagination”. Judge for yourself. Hi there, how’s it going? We are back in the USA again. We kicked off our new leg of the “Loud and Clear” tour in Tampa, Florida two days ago. It was great to play again after our eight week break, and we weren’t too rusty (I think!!?). We have changed our set list quite a bit since the last tour. Dolores asked us if we would be up for trying “God Be With You Ireland”, the song she wrote for a movie (The Devil’s Own). It sounds very powerful so I think it will be a permanent resident in the set for a while. We did a video for “Just My Imagination” in Dublin just before we came over here it will be released (only in America) in a couple of weeks. I’ll see if I can put it up here for you. Hmmm… Just My Imagination will be a US-only release? Sounds like it to me! Cool! I wonder what the video’s concept or director is? They may have stuck to Olivier Dahan again. That’s the news for now. Ok, Ok, I got the setlist from the Flordia show.. Check it out!! ALRIGHT!! They’ll be doing “Go Your Own Way”, “God Be With You”, “Dying In the Sun”, and “Just My Imagination” this tour — all of which were not previously done live. Wow. Glad I got something to look forward to..
Hey, check out this new Bury the Hatchet ad I dug up..
As you can see, it shows the infamous BTH “Red Room” shot, while down at the bottom, the ad boasts all the new awards that the album has received… interesting. Anyway, this is what’s known as a “Trade Ad” and is passed around to those in the music industry and is not available to the public. Don’t let this stuff burn a hole in your monitor! The Cranberries will appear on November 4th as guests on the TV show “Charmed”. “Charmed” is a TV show aired on the WB network worldwide and also airs on CTV in Candada. — singer DOLORES O’RIORDAN of the Irish rock group THE CRANBERRIES, on her newfound experience as a mother. The Berries will be featured on an upcoming movie, “Another City, Not My Own”. The movie itself is based on a book by Dominick Dunne and and it is directed by Robert Altman. The soundtrack will be released this year sometime, but the exact date or song is unkown. Thanks to Vance (VPegado@aol.com) for submissions for today’s news! Two shows featuring the Berries are lined up to air this month. Thursday, August 19th — The Cranberries will be featred on “MuchMusic Spotlight” – a show playing music videos of highlighted bands. This page was updated yesterday, but appearently, the updates didn’t save. Well, then it looks like you get a big batch of news! TV commercials are currently running in the New York area for the Jones Beach concert this month. The commercial includes video clips of Dreams, Promises, and other videos. But the most interesting part of the commecial is professional video footage of the Hamburg Germany concert from this year. 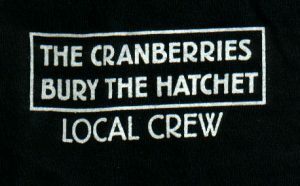 I *finally* got ahold of a scan of a new BTH tour shirt! Interestingly enough, this is actually a crew shirt. Check it out!